Members of the taskforce take every opportunity to visit libraries all around the country – it is probably one of the best bits about this job. I joined the team to work on communications, and although I’ve only been working with them for a month, I’ve already seen lots of libraries which illustrate the diversity of service around the country. As mentioned before on this blog, the third meeting of the Taskforce was held in Exeter, and highlights of that tour included their FabLab (which will probably feature in a future blog post of its own), an enterprise space which offers lots of support to new businesses, staff moving around the library linked by walkie talkie rather than sitting behind a desk, and colourful murals in the children’s library painted by a member of staff. 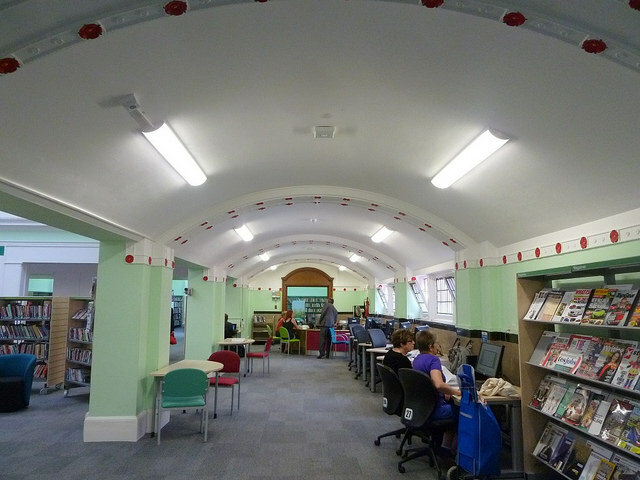 Northampton central library is in a Carnegie-funded library building which is over 100 years old – but it has been brightly decorated and was the first time I had seen a library shop. There were large electronic display screens advertising digital sessions, and a castle defined the children’s library. (Something I discovered later, apparently Northampton had the first purpose built children’s library in the country!) Upstairs there are pods available to rent for meetings in the business zone, and lots of potential opportunities for their Carnegie room. We were all impressed by the fantastic reuse of an old building in Market Harborough. The former corset factory with its huge windows has been transformed into a community hub, where bright modern spaces are decorated with artifacts from the museum which shares the first floor with them. 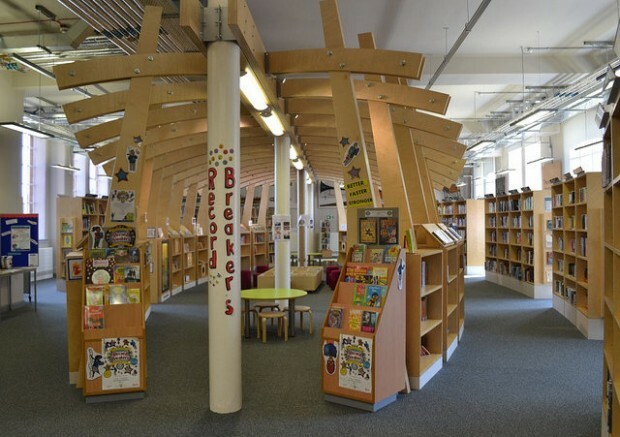 The childrens library is particularly imaginative – its enclosed by wooden spars which are reminiscent of the framework of a corset, but they have a digital floor to play on! We spent a rainy Monday visiting 2 libraries in Lewisham. 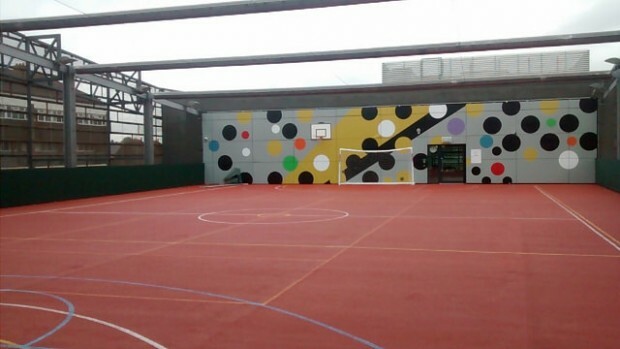 Despite the downpour, Sydenham community library and re-use centre was a bright welcoming space. There were lots of visitors, including people using the static computers, or having brought in their own to use the wifi. There was a volunteer recording a child’s 4th book completed as part of the summer reading challenge, and another (a retired teacher) listening to a child reading. We also visited Deptford Lounge - a first for me, a library with a football field on the roof. Lewisham libraries now have an interesting model for how they are managed. None had to be closed, but the solution for each reflects the community it is part of. We’ll write more in a future post. We visited the tiny community library in a former chapel in the village of Harbury, in Warwickshire. Books and access to computers are provided by Warwickshire library service, but since the community took over they have installed a cafe which has contributed to making it a highly prized community venue. It is now open 6 days a week (compared to 3 pre-community oversight). 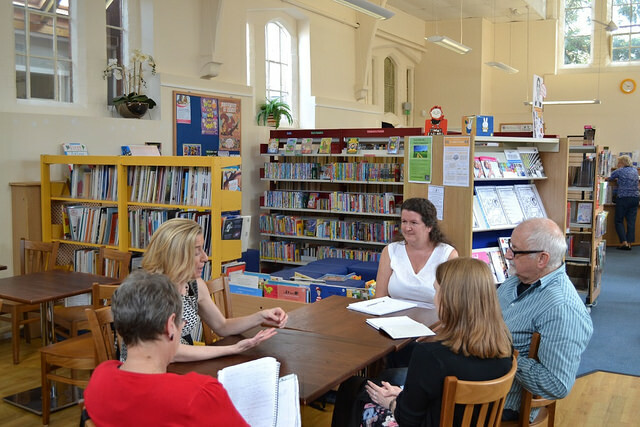 Taskforce members meeting staff in Harbury community library. Members of the team have visited many more libraries, as can be seen on this map. We'll continue to travel the country gathering examples of the wide range of different things that are going on - and will blog here about many more examples. You can also see lots more photos from our visits in our flickr account. Keep in touch. Sign up to email updates from this blog, or follow Julia on twitter. Great to see the Blog and updates on your work . Thanks. 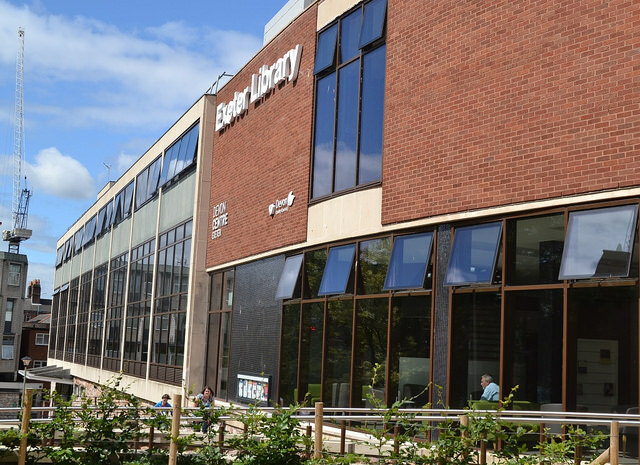 Why not visit The Hive on Worcester, the first truly integrated public/university library? You could have a West Mids day? Thanks for both comments - sounds an excellent idea! And why not visit Hereford (when the library reopens after asbestos has been removed). You will see what an uphill task you face, for this city centre, county library, is an absolute disgrace. The only bits that are right are the wonderful staff working in dire conditions.